Dormant axillary buds allow plants to repair minor damage to their canopies. In woody plants, these buds subsequently develop into epicormic structures that mayallow vegetative recovery after major disturbances. They are an essential but little-studied part of the persistence niche.We wondered what bud reserves were present in the leaf axils of northern Australian myrtaceous species, what levels of protection they have, and how this relates to the ecology of these species. Axillary buds of 21 species from 10 genera of northern Australian Myrtaceae were examined anatomically. All species possessed axillary buds in all axils examined, and accessory buds were recorded in 86% of species. The species exhibited an extremely wide range of variation—from axillary buds that consisted of only an apical dome with no leaf primordia (Calytrix exstipulata) to axils with a complex array of accessory buds and meristems located beneath the axil surface (Corymbia and Eucalyptus). 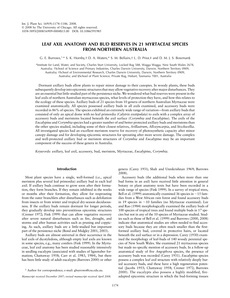 The axils of the Eucalyptus and Corymbia species had a greater number of and better protected axillary buds and meristems than the other species studied, including some of their closest relatives, Arillastrum, Allosyncarpia, and Stockwellia. All investigated species had an excellent meristem reserve for recovery of photosynthetic capacity after minor canopy damage and for developing epicormic structures for sprouting after more severe damage. The complex and well-protected axillary bud or meristem structures of Corymbia and Eucalyptus may be an important component of the success of these genera in Australia. axillary, leaf axil, accessory, bud, meristem, Myrtaceae, Eucalyptus, Corymbia.